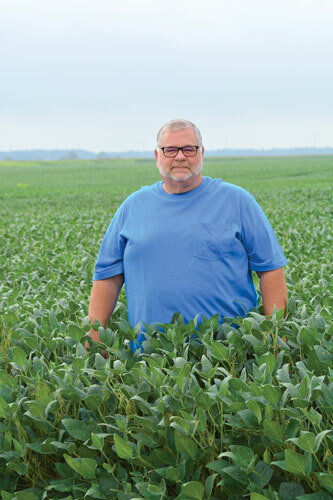 Bret Davis, a Delaware County Soybean farmer, serves on the board of the Ohio Soybean Association and the nine-member Board of Governors for the American Soybean Association. Drive along our state’s highways and it’s pretty hard to miss the factories, steel mills, auto plants and other manufacturing facilities that immediately bring to mind visions of big industry. What a lot of people miss, in between those monuments to business success, are the endless fields of soybeans and corn and the other farms that are the backbone of our state’s economy. AgriBusiness in Ohio is by far and away our state’s largest industry, responsible for a total economic output that is in excess of $100 billion a year. It’s also incredibly diverse in terms of both its production chain and demographic scope. When you actually think about it, the one in eight number might be conservative. In a larger sense, the industry not only includes the farmer and their employees that produce the crops, but everyone from the person who makes tires for a combine to the person selling the combine to the truck driver that hauls the grain up to Toledo to the crew that helps load the grain on a vessel bound for European markets and everything in between. Farmers in Ohio do enjoy distinct advantages over their competitors in other states, simply because of our state’s location. We sit at the western edge of the East Coast population, right on the eastern edge of the Corn Belt. 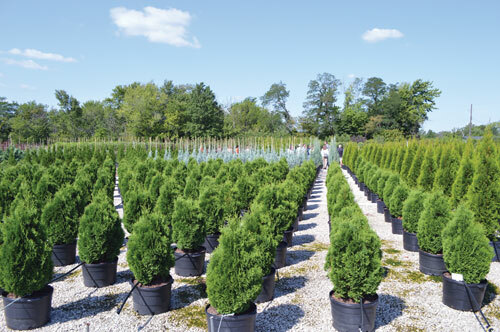 The nursery industry in Ohio generates approximately $4 billion. The turfgrass industry is approximately $4.6 billion. 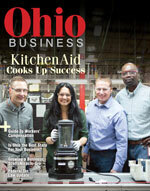 The green industries economic contribution to Ohio is $5.14 billion. All green sectors combined support 77,664 full- and part-time jobs. prime position in terms of getting product to market from a logistics standpoint. But that also creates challenges. But Ohio farmers face other challenges as well, some caused by their own success, others from outside forces beyond their control and still others that may be caused by new governmental policies. Like any other industry, agriculture is subject to the basic laws of supply and demand. And Ohio farmers have become a victim of their own success, becoming so efficient at raising crops, especially large commodity crops like soybeans, corn and wheat, that world prices have been kept down. This has put a squeeze on farming operations, says Cornely. But Ohio farmers have also consistently offset the laws of supply and demand in domestic markets by exporting crops to other countries. Realizing that only one in five consumers of agricultural products actually live in the United States, Ohio’s farmers have sought mouths to feed outside of our nation’s borders. Decades ago, Ohio’s farmers began to develop markets around the world, setting up offices, creating personal relationships and fostering business deals to the point where Ohio is the preferred supplier of a wide variety of farm products across the globe. “We have worked more than 30 years in foreign countries to grow our business by gaining access to markets and by finding new uses for soybeans,” adds Bret Davis, a Delaware County Soybean farmer who serves on the board of the Ohio Soybean Association and was elected for a third term on the nine-member Board of Governors for the American Soybean Association. Soybeans are Ohio’s No. 1 agricultural product. 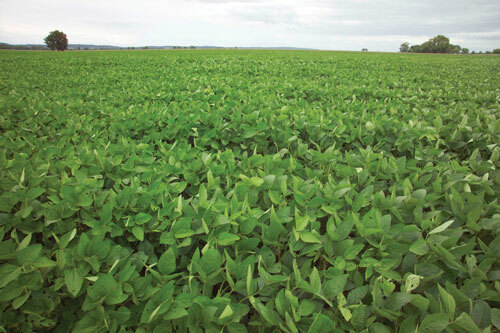 Ohio is ranked sixth in soybean production in the United States. The annual economic impact from soybean production in Ohio is $5.3 billion. There are 26,000 soybean farmers in Ohio. In addition to myriad food products such as tofu and cooking sauces, soybeans today are used in everything from cooking oils, to soy meal and even soy ink, “which is an ink that is not only environmentally friendly, but it doesn’t smear,” says Davis. “And if you’re sitting in a Ford car, there’s a good chance that you’re sitting on soy foam. Ohio’s $1.8 billion in soybean exports in 2017 accounted for more than 3.5 percent of all Ohio commodity exports. However, soybean futures are dropping thanks to China’s announcement of a proposed 25 percent retaliatory tariff on imported U.S. soybeans. Which, of course, brings us to the second major issue facing Ohio farmers today. Scattered across the economy, there is some evidence that the retaliatory tariffs imposed by China and others are biting, according to a recent economic update from David Wessell, senior fellow and director of the Brookings Institution’s Hutchins Center on Fiscal and Monetary Policy. Europeans are cancelling orders for blue jeans from a firm in North Carolina. Local newspapers are curtailing publication dates thanks to tariffs on Canadian newsprint. In our own state, Tusco Display, a maker of custom store fixtures and precision metal fabrications in Gnadenhutten in Tuscarawas County, laid off or furloughed 30 employees that it credited to the rising cost of both domestic and imported steel and aluminum. Even New England lobstermen say they are getting squeezed because China has doubled the tariff on lobsters coming in from the United States, while lowering the tariff on lobsters coming from Canadian waters. But the impact of China’s tariff on Ohio’s farmers is much more immediate and profound. New trade policy and the resulting retaliatory Chinese tariffs, have brought down the price of soybeans by $2 a bushel, which for Davis’ farm translates into a loss of $200,000 over the last two months. The suffering of farmers has not gone unnoticed by the current administration. Earlier this year, the U.S. Department of Agriculture announced $12 billion in federal “temporary relief” to farmers who have been hurt by retaliatory tariffs, a move derided by many liberal media outlets as “whack-a-mole” economics. But the international soybean market is not a kid’s game and the impact on farmers is very real. The future is not all doom and gloom. There appears to be an easing of tensions among NAFTA partners Mexico and Canada, as well as the European Union. According to Davis, sales to the E.U. have increased almost three fold over the last three months, and the president is talking about going back to the principle countries involved in the Trans-Pacific Partnership. “But all of these things are really miniscule when compared to what China means to us,” he says. However, trade and retaliatory tariffs are only one issue brought about by the current administration. While production of commodity crops like soybeans, corn and wheat is basically automated at the farm level, farmers growing other crops need workers. And the government’s stricter enforcement of immigration and guest worker programs is causing more than just concern. Earlier this year, immigration agents swarmed two locations of Corso’s Flower and Gardening Center in Sandusky and nearby Castalia, arresting more than 100 workers as a part of the Trump Administration’s crackdown on immigration enforcement. While Corso’s was back up and running in a matter of days, the arrests did send shockwaves through an industry that is very dependent on immigrants and guest workers. Belinda Jones is a legislative consultant for the Ohio Nursery and Landscape Association as well as the Ohio AgriBusiness Association and other green associations and coalitions of farmers and manufacturers in green industries across our state. 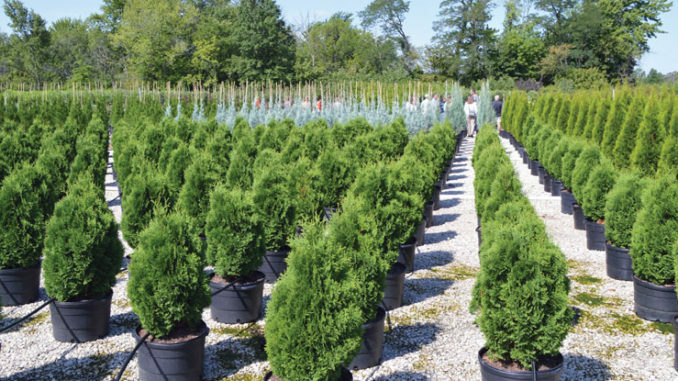 “Nationwide, Ohio is known for its robust nursery industry,” she says. “We bounce around in the top 10 nationwide for production and extremely high quality of nursery stock. I like to say that we are the Napa Valley for nursery stock in the Midwest. According to Jones, it’s not just illegal immigration enforcement, but also new restrictions on visas that are impacting legal seasonal workers and are hurting farmers and businesses in the nursery and landscape industry. The H2A and H2B programs (programs that allow industries with a labor shortage to tap into seasonal migrant labor) have restrictions that handicapped the industry’s ability to hire and meet the needs that farmers and businesses are demanding, adds Jones. The preference is to always hire domestic workers. “But no matter how hard we try, we are unable to find enough domestic workers that want to do this kind of work,” she adds. It’s also noteworthy that many of the jobs are well above minimum wage, roughly in the $12 to $14 an hour range, she says. Ironically, the Trump Administration, which is committed to reducing and cutting through regulation for most industries, may actually be adding some extra steps as a part of its efforts to enforce immigration and guest worker policies. While last on our list, the environment is certainly not least, according to farmers, workers in the AgriBusiness industries and consumers in general. In our state, the issue takes on a very real, tangible and identifiable result in the form of the algal blooms at the western end of Lake Erie. It is perhaps one of the most frustrating issues for Ohio’s farmers today, according to the resources contacted for this article. “The typical narrative on the Lake algae blooms is that farmers don’t care, and the government lets them get away with it,” says Cornely. “The only solution is piling on massive amounts of regulation and then the water will be pristine in a week. Farmers in Ohio have been working in partnerships to help address the problem. This voluntary program provides guidelines and independently certifies nutrient service providers, also known as agricultural retailers, on their adoption of proven best practices through the 4Rs, which refers to using the Right Source of nutrients at the Right Rate and Right Time in the Right Place. Since 2014, 47 ag retail facilities have been certified, 37 of which are in the Western Lake Erie watershed. Certified agricultural retailers work with over 6,000 farmers in Ohio covering 2.89 million acres of farmland. Of that, 1.9 million acres are located in the Western Lake Erie Basin, nearly half of the farmable land there. The farmers do have valid points. Certainly, increased use of fertilizers on suburban lawns and the subsequent run off have caused greater nutrients to enter the Lake Erie watershed. There have also been the unplanned releases of raw sewage from water treatment plants overwhelmed by rain events, which was recently witnessed in the Greater Cleveland area. And the problem is not just caused by Ohio agriculture or suburban fertilizer runoffs in our state. As a part of the St. Lawrence Seaway, the water in western Lake Erie not only comes from Western Ohio, but also Indiana, Michigan, Wisconsin, Illinois, Minnesota and Ontario. “Most people don’t understand the international and multi-state facet to what is a very complex issue,” says Cornely. For their part, farmers are economically motivated to take part in the programs that help conserve nutrients, says Davis.